Any of you Snack Girl readers hate Brussels Sprouts? I bet you are really looking forward to them on your Thanksgiving table. To be honest, I used to hate them too! My family used to boil them and serve these smelly, mushy, ugly blobs onto my plate. yuck. The problem is that when you boil them they seem to express more of the sulfurous taste associated with the cabbage family. What if you could turn your Brussels Sprouts into candy? You heard me right! Candy! The sweetness of fresh Brussels Sprouts is best expressed by roasting them in the oven. This technique caramelizes the sugar in the Brussels Sprouts and all of a sudden you have a different food altogether. Instead of a mushy blob, you have a crunchy side dish that will change your life. Really. One important tip - do not buy Brussels Sprouts and leave them in your refrigerator for a week. This is an excellent way to ensure that they taste terrible. The fresher the Brussels Sprouts, the sweeter they will taste. You can serve them cold, room temperature or hot. These would make a great party snack with some toothpicks and some mustard dipping sauce on the side. Also, you can roast a big batch and then toss them into salads or in your lunchbox for the week. Go buy some Brussels Sprouts! They are in season right now. I'm going to try this. I had brussels sprouts that I liked once, but haven't been able to recreate them at home. I tried sauteing them in a pan to kind of caramelize them, but most of them were still hard, obviously I didn't cook them long enough! I eat them like this a lot -- they are delicious! Brussels Sprouts will NEVER cross my threshold! No matter how my family doctored them I was reviled by them! I had a dish with brussels sprouts in it at a french restaurant that was quite palatable. They had separated the sprouts into individual leaves and then tossed the leaves in with a pasta-and-sausage combo with a few other veg. The sprout leaves were nearly raw, and since they were always included in a bite with something else, not overwhelming. These are the best, but I would roast at a higher temp (400). I get better carmelization, and they cook faster. Also, do not discard the leaves that fall off. They get nice and crispy, kinda like little sprout chips. I use similar recipe for green beans, broccoli, asparagus, cauliflower... I put them under the broiler for 5 minutes. For easier cleanup try cooking spray instead of bottled oil. My kids love any veggie roasted or broiled. Much better flavor. I can't remember the last time I steamed anything. Trader Joe's sells them in a pack you can cook in the microwave. I just pop them in and when they are done, I cut them in half, mix some light butter in, and sprinkle some parmesan on top. I love brussels sprouts steamed for 5-6 minutes, then tossed with a dab of butter and parmesan. To me, it IS like candy! 2 lbs brussel sprouts trimmed and halved, place on two cookie sheets, toss with extra virgin olive oil, some curry powder (which I don't have, so I use Paprika) and a little salt (which I don't use). Roast them at 450 for about 20 minutes until browned and tender. Transfer to a bowl and toss with 2 teaspoons of lemon zest and 2 tablespoons of fresh lemon juice. I love brussel sprouts... I hadn't made them at home for quite some time and I went to a neighbor's house and she had roasted brussel sprouts they were sooo good. So I went to the store and got some and made them at home, the first batch some of the brussel sprouts were too crunchy. They second time I made them, they had been sitting in my fridge too long! I was thinking they were giving off a horse radish like flavor, making my nose burn and stuff. I still ate them:-) But of course no one else in my family did. Thanks for the info and the recipe, I will have to try this and cut the brussel sprouts in half. Mmm, that sounds good too Allison! You can also add diced pumpkin and/or carrots along with the brussels sprouts for roasting. They make a great pair because of the sweetness of the carrots and the pumpkin. I LOVE brussells sprouts. I have 30 plants growing in my garden right now! YUM! My favorite is creamed sprouts. I steam them in the micro for a few minutes until they start to get tender. While they cook I saute a few pieces of bacon and a shallot in an oven proof skillet. Drain the sprouts and add to the pan with about 1 TBS of butter. Saute them until they are starting to brown. When they get to the color you like pour in a little bit of cream and stir. Add salt and pepper and serve! I wanna hear from a true blue brussel sprout hater if you try making this recipe what you really think of the taste. If you like it then I will attempt it myself. But you really have to not like those nasty veggies and if you're brave enough to try them in this recipe and it turns out you like them (or not) let me know please. PLEASE? Wandamharrison@yahoo.com. Thank you. Got my fingers crossed. I just whipped me up a batch today...with some onions, beet and carrots. YUMMY! I usually roast at 400 degrees. 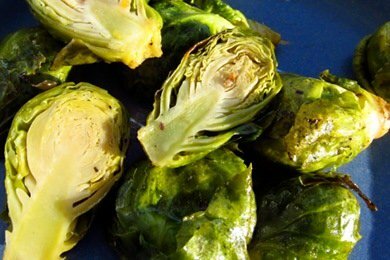 For people adverse to brussel sprouts, try this sweet twist on roasting. Shred or cut in half a pound or two of brussels. Add thick slices of green apple (thin slices will disintegrate) and thin slices of red onion. Toss with olive oil, salt and pepper and roast at 400 degrees for about 30 minutes, tossing occasionally, until brown. i make brussels sprouts just like this all the time, although i use the trader joe's olive oil spray (but if you want to see my mom's incensed comment about this spray, although it does end with love, mom, check out www.susanefine.com). my kids won't eat the brussels sprouts exactly, but they do eat the crunchy wonderful leaves that become like chips. i've heard from friends that their kids are similarly excited about kale chips. I love Brussel Sprouts! I had NO idea people hated them so much! lol...Roasted is my favorite (my kids too ages 2 & 4)! yummy...thanks for the share!